As a result of a car crash in central Moscow, a Subaru Forester smashed through the metal road railing and plunged into the Moscow River. The quick thinking and courage of a Moscow traffic cop saved a woman from an icy death. Her car was propelled into the Moscow River after a collision on the embankment, and it was sinking. A car accident on a downtown Moscow embankment late in the evening of Jan. 26 almost had fatal consequences. 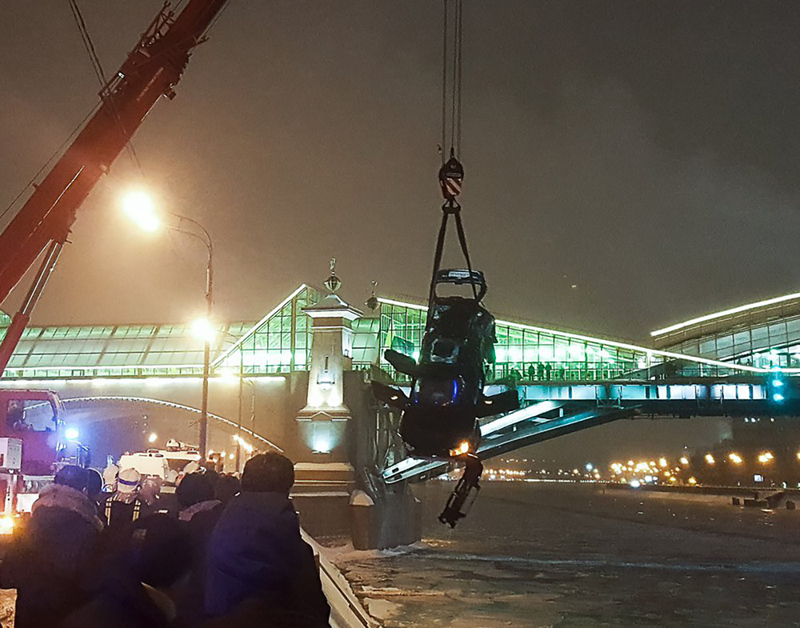 As a result of a two-car collision, a Subaru Forester smashed through the metal road railing and plunged into the Moscow River. A traffic officer on the scene, 34-year-old Captain Alexei Konyaev, did not wait for rescuers to arrive, and instead jumped into the icy water and pulled the young lady out of the car to safety, reported (in Russian) Gazeta.ru citing Interior Ministry Spokeswoman Irina Volk. The policeman was later diagnosed with hypothermia and lacerations on both wrists. The officer managed to get into the car with the help of a piece of ice that he used to break the car window, and then he pulled the woman out of the sinking car. After, "his colleagues and eyewitnesses used a towing cable to help the policeman and the woman get ashore," said Volk, adding that the courageous police officer has already been recommended for a state honor. According to TASS, a bystander at the scene of the accident also helped (in Russian) to rescue the woman. "Police are now looking for this man to learn of his condition, express gratitude for saving the woman, as well as find out details of the accident," said the TASS source. According to the media, the second rescuer is Murat Shomakhov.